View basket “Esys 12 Braille Display” has been added to your basket. Rivo has been designed to assist people who are blind or visually impaired to use smartphones easily, quickly and precisely. Now Rivo 2 is developed to be an ideal and indispensable accessory to assist them even more especially in using the iPhone; it controls iPhone with extensive VoiceOver commands, supports typing and editing text, delivers every sound from iPhone to its speaker and earphone jack, delivers user voice captured from its microphone to iPhone for Siri and phone calls, and more. Currently, it works with iPhone but will also support Android as well through firmware updates. Navigation About 20 commands, including Force Touch and Search, have been added to support a total of about 50 VoiceOver navigation commands. Sound All the sounds including VoiceOver can be played back through built-in speaker or earphone jack and can be switched instantly between iPhone and Rivo. Text typing & editing Rivo supports typing of 27 languages at iPhone with one or two set to be active at a time. You can also edit the text by moving the cursor, making a selection, performing operations like cut, copy, paste, undo and redo, etc. Phone When there’s an incoming call, Rivo vibrates or plays the phone ringtone, and you can receive the call with Rivo. During a phone call, you can receive a second incoming call and switch between the calls. You can also dial a phone number directly with Rivo. Touch-tones DTMF touch-tones are supported for interactive voice response systems such as telebanking, voicemail, etc. Siri You can activate and use Siri with Rivo using its built-in microphone and speaker. 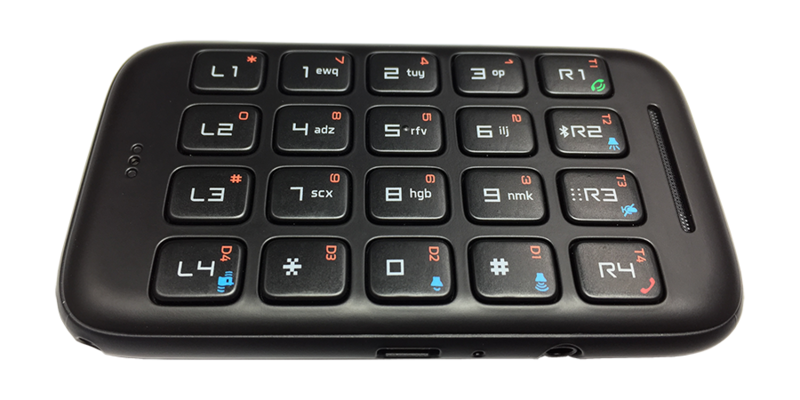 Audio remote Rivo can be used like an audio remote. One-handed mode Rivo supports one-handed mode so that people can use it comfortably with one hand while on the move as well as two-handed mode to use it efficiently with both hands. Device connection Up to six devices can be stored and connected instantly with Rivo. Battery The battery level can be checked, and if only the keyboard is used, you may use it for more than 15 days after charging for about 3 hours. Update Firmware update is supported.